← The audience game is forever changed; will we change, too? It’s the Year of the Millennials, according to Pew. In 2015, at ages 18 to 34, they will surpass Baby Boomers in the U.S. to become the largest living generation. And a major new report by the Media Insight Project, just released at the NAA mediaXchange, sheds a lot of new light on their consumption of news. 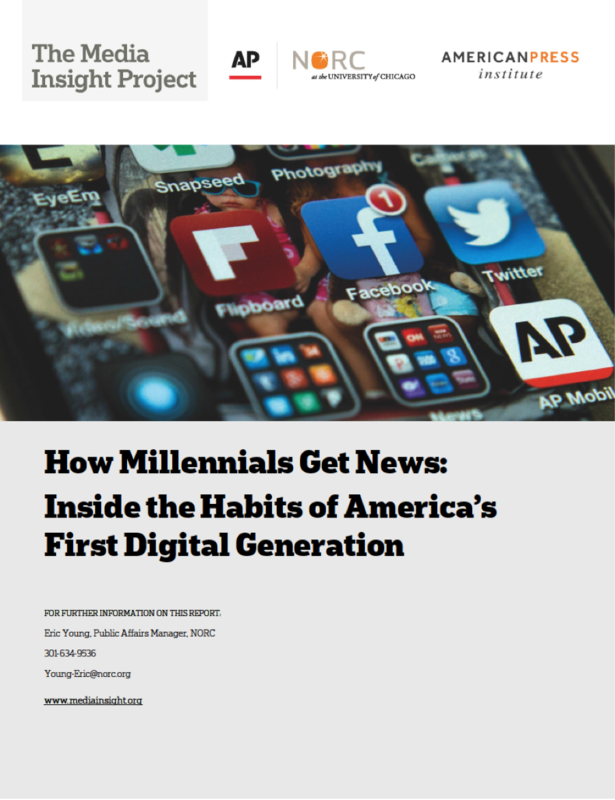 The report (pdf, html) emphasizes the bright side, stressing the finding that most Millennials do value news and consume it regularly. But the most worrisome finding for newspaper companies is that they rarely go to traditional news providers to get it. We are far back in the loop, when we’re in it at all. Beyond that key point, the most important things to grasp in this report are 1) how drastically the normal news behaviors of Millennials differ from those of their parents and grandparents, and 2) how greatly their news interests differ. These differences are not, as you might think, because they’ve grown up with digital devices. They are because they’ve grown up with social media, and that’s where they get their cues to the news. It works like this: In their frequent visits to social media, the steady buzz among their circles of friends often includes mentions, links or comments about things in the news. These may pique a Millennial’s interest enough to click on a link or do his/her own searches to learn more. Only sometimes, these may lead to a story on the website of a newspaper, a television network or a TV station. This pattern is totally different from the behavior model of their grandparents and most of their parents. For these older generations, news behavior began each day — still does, for many — with a planned “visit” to a printed newspaper or a news broadcast. What they see there, very significantly, is not crowd-selected. It’s hand-picked by editors or news directors who choose what they believe are the most important or most interesting stories. The contrast is striking: The pre-Millennials do news by appointment, consuming news that specialists choose for them. The Millennials mostly do news episodically as it appears on their social screens, recommended one piece at a time by people like them. And there’s another huge factor not mentioned in the report. The news specialists choose news from a limited budget of news stories each day, while the crowd chooses content from all over the vastness of the Web. Some of this content fits the traditional definitions of news, but much of it doesn’t. It’s literally everything from cat videos to campus shootings. This reminds me of a story told many years ago by John Hile, my best friend in high school. After we graduated in 1968, John got a degree in zoology, then realized just how scarce those jobs were. So he joined the Peace Corps. They sent him into the jungles of Borneo to build water supplies for the Iban people, who lived in remote longhouses without electricity or running water. The work involved leading a team from the longhouse in hauling bags of cement up into the hills, where they would find a stream, build a small concrete dam and install a hydraulic pump. Then they would lay PVC pipe down to the longhouse and install a tap where everyone could use it. When the work was done, they would gather everyone for a ceremony in which John would invite the headman to turn the tap. Clean water would gush out, greeted by cries of joy and wonder. After each day’s work, John and his hosts would squat around a fire to eat dinner and talk. During the meal, John said, an Iban sometimes would ask him what Americans ate. He would answer with a list of many foods — beef, chicken, pork, fish, vegetables, cheese, beans, bread, milk, fruit and so on. And John would explain that, no, actually, Americans ate rice only occasionally — maybe once or twice a month. It was just one of their options. The Ibans and rice were like Baby Boomers and news. As the Ibans grew up with rice as a staple and considered rice essential, Boomers grew up on news as a staple and still consider it essential. What we pre-Millennials had was the news that editors and news directors chose for us, and it seemed like all we needed. The Millennials are like John in this story. They have grown up with an infinite supply of content, in infinite varieties, available at their fingertips. They can’t imagine living only on news as Boomers would define it. Among these categories, most of them — and all of the highest-rated — relate to personal interests of individual Millenials. They’re trying to lead their lives, and they’re looking for information that helps them do that. The usual civic categories — national politics; city, town and neighborhood; social issues; natural disasters, schools and education, business and economy — are well down the list. In this new era of infinite supply, that’s how people will use media. Millennials are the first wave of humanity that’s free to find what they enjoy the most, and what relates most closely to their interests, tastes and needs. To them and the generations that will follow, that’s what media are for. News still fits into that picture, as the report confirms — but in a way very different from previous generations. 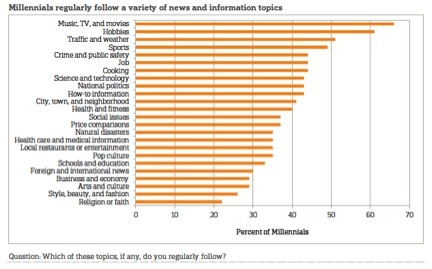 So, when the report offers the reassurance that 85% of Millennials say “keeping up with the news is at least somewhat important to them,” and 69% say they “get news daily,” it’s important to remember how differently they use these terms. And they spend much less time on it than their elders, as Pew research shows in the table at right. So what’s a newspaper company to do? We seem to be stuck in last place with most Millennials. Most are not looking for a curated presentation of news and information as the traditional media have always defined it. Rather, they’re looking for what’s relevant and important to them and therefore what’s worth sharing. To make it onto their attention screens, we need to be presenting content they consider share-worthy. Several sites are doing this successfully on the national level, led by the likes of Vice.com and BuzzFeed.com, as Ken Doctor has pointed out. On the local level, however, it’s a whole different proposition. The Charlotte Observer’s www.charlottefive.com is one example of a creative attempt by a traditional media company to figure it out. It offers just five stories a day in a mobile-first website, with subjects and story treatments specially chosen to appeal to Millennials. As explained here, they’re thinking beyond traditional news models and voicing. I think the key is in realizing that Millennials — as much as any of us — are focused on making rewarding lives in the communities where they live. If we can give them the information they need to do that — and discover what they will share with their social networks — we could be rewarded with large and growing Millennial audiences. In a posting a while back, I outlined seven kinds of content that would help to do the job. Meanwhile, of course, we need to keep producing traditional news at the same time. The best model, as I see it, is to do as The Charlotte Observer has done, creating a separate team and delivery channel focused intently on the specific needs, lifestyles and interests of the Millennials. Now that Millennials have surpassed the Baby Boom, it’s time to figure it out. Posted on March 17, 2015, in Audience, Content, Disruption, innovation, Media business model, News, Newsrooms and tagged Media Insight project. Bookmark the permalink. 2 Comments.